« 3/9 Happy spring, everyone! Lo-mein is great for using up scraps. Often my lo-mein-like dishes are made with stems from various vegetables from recent CSA deliveries. But over the past couple of weeks, I’ve found myself with mostly scrap leaves. 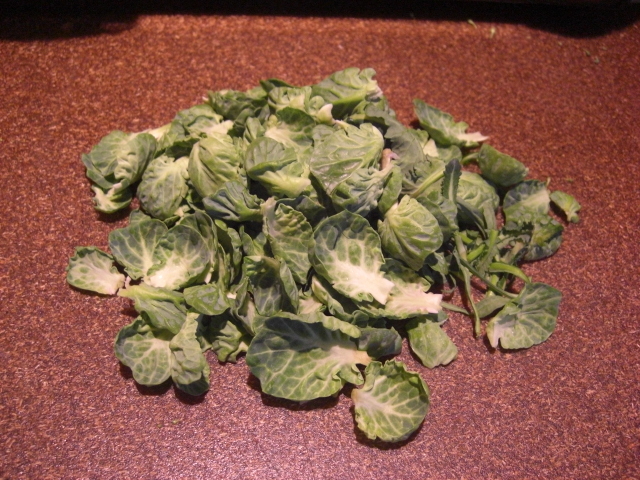 Recipes for cooking Brussels sprouts always say to remove the loose, outside leaves and trim the tough ends. The ends can go, but the little leaves are too cute to throw away! I don’t think of celery leaves as scraps. (But I used to.) 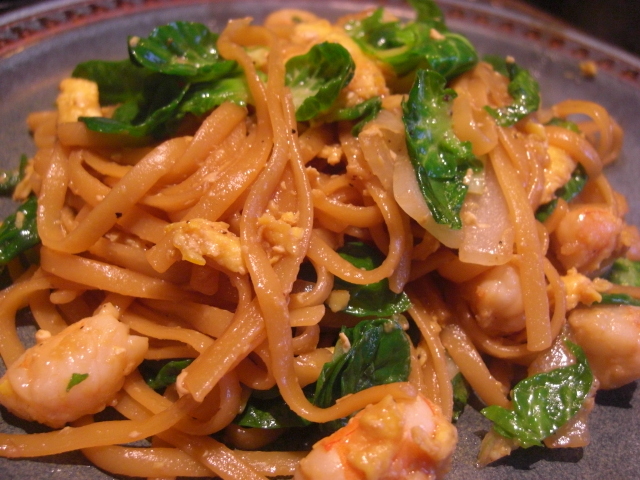 They are wonderful to add to almost anything you’re cooking – including lo-mein. The shrimp were from the Farmers’ Fresh store. I’ve bought a few bags before, and the shrimp have always been delicious – and time-consuming to clean. However, the shrimp I pulled from this new bag were easy. Only one of six needed any cleaning after I peeled them. This is a good thing, except I feel bad for shrimp caught and frozen on an empty stomach. I’m so happy to have hit on a simple, non-sweet lo-mein sauce recipe. Roughly, its 3 parts soy sauce, 2 parts sherry, and 1 part sesame oil and sweet rice vinegar. Just keep tasting it till you like it. Whisk it up and add it to the pan after cooking and removing the protein and veggies. (You can also stretch it with another part or two of pasta water.) Let it bubble for a minute and then add the (al dente) pasta to the pan and let it cook in the sauce for a couple of minutes. Finally, add back in the rest of the ingredients, heat through, and serve.